Bigelow Center Receives $11K Check from Rocco & Assoc. Fairfield, CT - This past July, the Fairfield Police Department organized its 1st Annual Fairfield Police Sunset 5k Race at Penfield Beach to raise funds and awareness for the Fairfield Police Union Scholarship Fund and the Friends of the Bigelow Center for Senior Activities, nonprofit volunteer organization. Rocco & Associates Wealth Management, Inc. of Fairfield was the presenting sponsor. The idea for the race was inspired by Fairfield Police Lieutenant Keith Broderick and Eric Johnson, COO, of Rocco & Associates. On October 25, Rocco & Associates visited the Bigelow Center for Senior Activities and presented a check in the amount of $11,035 to the Friends of the Bigelow Center for Senior Activities. Rocco & Associates had also presented a check to the Fairfield Police Union Scholarship Fund in the amount of $11,305. The Fairfield Police Union Scholarship Fund was established in 2014 and benefits the children of Fairfield Police Officers. Each year, scholarships are awarded to the children of current Fairfield Police Officers. In addition, the union funds scholarships through the Fairfield High School Scholarship Foundation which awards scholarships annually to graduating Fairfield High School seniors who plan to pursue a career in law enforcement or are the children of a Police Officer. 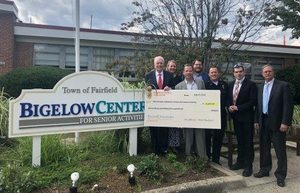 The mission of the Friends of the Bigelow Center for Senior Activities is to provide funding for enhancements to the programs, services and facilities at the Bigelow Center for Senior Activities of Fairfield. The proceeds have been divided equally between the two charities. The race, which the Fairfield Police Department intends to hold next summer on Wednesday July 24th, included a one-mile walk and Kids & Cops Scamper along with food trucks, games and face painting for kids.